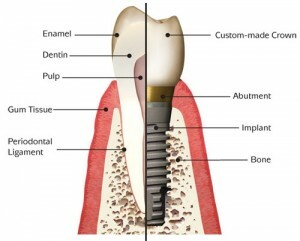 Thinking of getting dental implants in Oklahoma City, Oklahoma? The following guide lists the top dental clinics, what you can expect to pay for a dental implant in Oklahoma City. Click on the profile of a dentist near you to read more about them. Here are some examples of how much people have paid for dental implants in Oklahoma. Oral & Maxillofacial Surgeons, James A. Baker, DDS, Jacob W.B. Mendenhall, DDS and Peter L. Carlson, DDS, Oklahoma City,OK, practice a full scope of oral and maxillofacial surgery with expertise ranging from corrective jaw surgery to wisdom tooth removal. The dental clinics in Oklahoma serve the following areas. Click on a county or region below for a list of the best dentists in that area.